Close-up view of lichen planus. Direct immunofluorescence study reveals globular deposits of immunoglobulin M (IgM) and complement mixed with apoptotic keratinocytes. No imaging studies are necessary. Lichen planus (LP) is a pruritic eruption commonly associated with hepatitis C. Lesions are characteristically papular, purple (violaceous color), polygonal, and peripherally located (eg. on the distal extremities). LP may also affect the genitalia or mucous membranes. It is most likely an immunologically mediated reaction, though the pathophysiology in unclear. See Oral Lichen Planus for more information on this variant of lichen planus. Lichen planus is a cell-mediated immune response of unknown origin. It may be found with other diseases of altered immunity; these conditions include ulcerative colitis, alopecia areata, vitiligo, dermatomyositis, morphea, lichen sclerosis, and myasthenia gravis. The exact cause of lichen planus is not known, although it is immunologically mediated. The initiating antigen is unclear; however, Langerhans cells process the antigen to T lymphocytes, resulting in an epidermotropic infiltrate. Histologically, the inflammation is described as a lichenoid infiltrated, effacing the dermo-epidermal junction. Some patients with lichen planus have a positive family history. It has been noted that affected families have an increased frequency of human leukocyte antigen B7 (HLA-B7). Others have found an association between idiopathic lichen planus and human leukocyte antigen DR1 (HLA-DR1) and human leukocyte antigen DR10 (HLA-DR10); thus, lichen planus may be influenced by a genetic predisposition. Lichen planus is reported in approximately 1% of all new patients seen at health care clinics. Some areas have reported a higher incidence in December and January. No significant geographical variation in frequency exists for lichen planus. No racial predispositions have been noted for lichen planus. The prognosis for lichen planus is good, as most cases regress within 18 months. Some cases recur. In lichen planus, atrophy and scarring are seen in hypertrophic lesions and in lesions on the scalp. 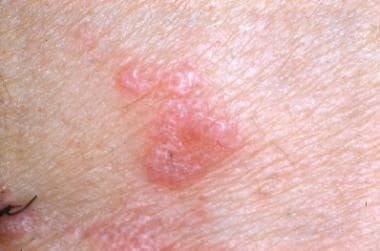 Cutaneous lichen planus does not carry a risk of skin cancer, but ulcerative lesions in the mouth, particularly in men, do have a low rate of malignant transformation. However, the malignant transformation rate of oral lichen planus is low (< 2% in one report). Vulvar lesions in women may also be associated with squamous cell carcinoma. Patients should be told about the self-limiting nature of lichen planus. Because lichen planus is not common, no large, randomized, controlled clinical trials have been conducted for therapy. Several treatments may need to be tried. Patients should be told about the small likelihood of recurrence and the potential adverse effects from the various treatments offered. Alaizari NA, Al-Maweri SA, Al-Shamiri HM, Tarakji B, Shugaa-Addin B. Hepatitis c virus infections in oral lichen planus: a systematic review and meta-analysis. Aust Dent J. 2015 Oct 17. [Medline]. Chuang TY, Stitle L, Brashear R, Lewis C. Hepatitis C virus and lichen planus: A case-control study of 340 patients. J Am Acad Dermatol. 1999 Nov. 41(5 Pt 1):787-9. [Medline]. Bigby M. The relationship between lichen planus and hepatitis C clarified. Arch Dermatol. 2009 Sep. 145(9):1048-50. [Medline]. Raslan HM, Ezzat WM, Abd El Hamid MF, Emam H, Amre KS. Skin manifestations of chronic hepatitis C virus infection in Cairo, Egypt. East Mediterr Health J. 2009 May-Jun. 15(3):692-700. [Medline]. Atzmony L, Reiter O, Hodak E, Gdalevich M, Mimouni D. Treatments for Cutaneous Lichen Planus: A Systematic Review and Meta-Analysis. Am J Clin Dermatol. 2016 Feb. 17(1):11-22. [Medline]. Fazel N. Cutaneous lichen planus: A systematic review of treatments. J Dermatolog Treat. 2015 Jun. 26(3):280-3. [Medline]. Rasi A, Behzadi AH, Davoudi S, Rafizadeh P, Honarbakhsh Y, Mehran M, et al. Efficacy of oral metronidazole in treatment of cutaneous and mucosal lichen planus. J Drugs Dermatol. 2010 Oct. 9(10):1186-90. [Medline]. Omidian M, Ayoobi A, Mapar M, Feily A, Cheraghian B. Efficacy of sulfasalazine in the treatment of generalized lichen planus: randomized double-blinded clinical trial on 52 patients. J Eur Acad Dermatol Venereol. 2010 Feb 10. [Medline]. Arias-Santiago S, Buendia-Eisman A, Aneiros-Fernandez J, et al. Cardiovascular risk factors in patients with lichen planus. Am J Med. 2011 Jun. 124(6):543-8. [Medline]. Pavlotsky F, Nathansohn N, Kriger G, Shpiro D, Trau H. Ultraviolet-B treatment for cutaneous lichen planus: our experience with 50 patients. Photodermatol Photoimmunol Photomed. 2008 Apr. 24(2):83-6. [Medline]. Korkij W, Chuang TY, Soltani K. Liver abnormalities in patients with lichen planus. A retrospective case-control study. J Am Acad Dermatol. 1984 Oct. 11(4 Pt 1):609-15. [Medline]. Manolache L, Seceleanu-Petrescu D, Benea V. Lichen planus patients and stressful events. J Eur Acad Dermatol Venereol. 2008 Apr. 22(4):437-41. [Medline]. Murphy R, Edwards L. Desquamative inflammatory vaginitis: what is it?. J Reprod Med. 2008 Feb. 53(2):124-8. [Medline]. Balasubramaniam P, Ogboli M, Moss C. Lichen planus in children: review of 26 cases. Clin Exp Dermatol. 2008 Jul. 33(4):457-9. [Medline]. Ingafou M, Leao JC, Porter SR, Scully C. Oral lichen planus: a retrospective study of 690 British patients. Oral Dis. 2006 Sep. 12(5):463-8. [Medline]. Belfiore P, Di Fede O, Cabibi D, et al. Prevalence of vulval lichen planus in a cohort of women with oral lichen planus: an interdisciplinary study. Br J Dermatol. 2006 Nov. 155(5):994-8. [Medline]. Di Fede O, Belfiore P, Cabibi D, et al. Unexpectedly high frequency of genital involvement in women with clinical and histological features of oral lichen planus. Acta Derm Venereol. 2006. 86(5):433-8. [Medline]. Lucchese A, Dolci A, Minervini G, Salerno C, DI Stasio D, Minervini G, et al. Vulvovaginal gingival lichen planus: report of two cases and review of literature. Oral Implantol (Rome). 2016 Apr-Jun. 9 (2):54-60. [Medline]. Robles-Méndez JC, Rizo-Frías P, Herz-Ruelas ME, Pandya AG, Ocampo Candiani J. Lichen planus pigmentosus and its variants: review and update. Int J Dermatol. 2018 May. 57 (5):505-514. [Medline]. Pai VV, Kikkeri NN, Sori T, Dinesh U. Graham-little piccardi lassueur syndrome: an unusual variant of follicular lichen planus. Int J Trichology. 2011 Jan. 3 (1):28-30. [Medline]. Gonzalez-Moles MA, Scully C, Gil-Montoya JA. Oral lichen planus: controversies surrounding malignant transformation. Oral Dis. 2008 Apr. 14(3):229-43. [Medline]. Knackstedt TJ, Collins LK, Li Z, Yan S, Samie FH. Squamous Cell Carcinoma Arising in Hypertrophic Lichen Planus: A Review and Analysis of 38 Cases. Dermatol Surg. 2015 Dec. 41(12):1411-8. [Medline]. Lim KK, Su WP, Schroeter AL, Sabers CJ, Abraham RT, Pittelkow MR. Cyclosporine in the treatment of dermatologic disease: an update. Mayo Clin Proc. 1996 Dec. 71(12):1182-91. [Medline]. Conrotto D, Carbone M, Carrozzo M, et al. Ciclosporin vs. clobetasol in the topical management of atrophic and erosive oral lichen planus: a double-blind, randomized controlled trial. Br J Dermatol. 2006 Jan. 154(1):139-45. [Medline]. Lai YC, Yew YW, Schwartz RA. Lichen planus and dyslipidemia: a systematic review and meta-analysis of observational studies. Int J Dermatol. 2016 Feb 12. [Medline]. Lichen planus on the flexor part of the wrist. Lichen planus shows Wickham striae (white, fine, reticular scales). Lichen planus on the oral mucosa with ulceration in the center of the lesion appears with whitish papules and plaques in the periphery.